Nicholas R. Stuchell was born and raised in Reedsville, West Virginia. He comes from a coal mining family. After high school, Nicholas worked his way through West Virginia University where he received a B.S. in Advertising with a second concentration in Business Administration. Nicholas then earned his J.D. from West Virginia University College of Law. While there he focused his studies on business law, securities, intellectual property and health care law. 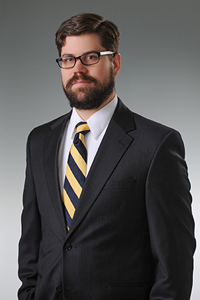 During the summer of 2006, Nicholas studied comparative law in Brazil. Since 2010 Nick has been at Daniels Law Firm, PLLC. During that time, Nick has represented contractors with a variety of issues including, civil litigation, workers’ compensation, bond claims, mechanics’ liens, business transactions and more. Nick has also helped clients with various estate planning needs. He is licensed to practice in West Virginia and Kentucky.